UMASH joined the National Children’s Center for Rural and Agricultural Health and Safety and Health (NCCRAHS) at the 2017 Upper Midwest Vegetable and Fruit Growers Annual conference and Trade Show in St. Cloud Minnesota on January 20, 2017. 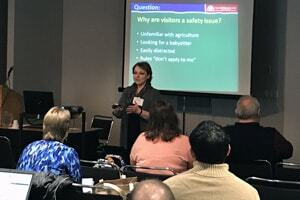 Marsha Salzwedel (NCCRAHS) presented two sessions on agritourism: Visitors on Farms & Ranches…Keeping Them Safe, and Emergency! How Do I Plan for That?